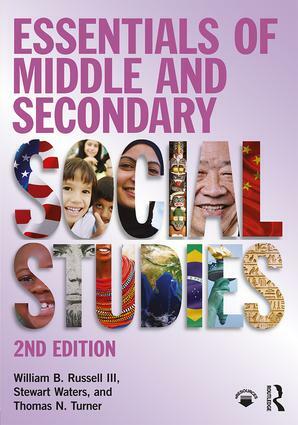 Building on the success of the first edition, Essentials of Middle and Secondary Social Studies 2nd Edition focuses on the key issues central to the teaching of middle and high school social studies, including lesson planning and instructional strategies. Written in an engaging, conversational style, the text encourages teachers in their development as professionals and enables them to effectively use creative and active learning strategies in the everyday classroom. An updated chapter on lesson plans, in keeping with the book’s emphasis on planning and teaching. This chapter is designed to provide middle and secondary teachers with new classroom-tested lesson plans and includes two classroom-tested lessons for each grade level (6-12). An expanded chapter on planning. This chapter provides additional discussion about long-range planning and includes examples of lesson plans with details to help students be better prepared. An updated chapter on technology designed to better prepare middle and secondary teachers to effectively incorporate technology into social studies instruction. Attention is given to digital history, media literacy, teaching with film and music, popular apps and numerous other types of impactful technology. "FYI" callouts throughout each chapter. These callouts provide helpful information and further explanation. An expanded discussion of the Common Core Standards and C3 Framework and how they impact teachers. An updated chapter titled "Experiencing Social Studies." This chapter focuses on topics such as teaching with drama, role play, field trips, and service learning. A "Helpful Resources" section that details various websites and online resources for further discovery. William B. Russell III is Professor of Social Science Education at The University of Central Florida. Stewart Waters is Associate Professor of Social Science Education at The University of Tennessee, Knoxville. Thomas N. Turner is Professor Emeritus of Social Science Education at The University of Tennessee, Knoxville.